It is a truth generally acknowledged that there are two kinds of fashion — one kind that screams for attention and the other for us normal people. The “boots” above fall into the former category. They are very tall. Their uppers are made of stretchy synthetic fabric instead of leather or suede. Their colors are pretty darn vivid. And their heels are at least 4 inches high. They are not for everyone. Spain’s Balenciaga house appears to have been the first to release such boots. Last spring it convinced (or paid) one celebrity to wear a bright red pair under white gown with a slashed skirt to the annual Met Gala. Then Kylie Jenner paired a purple pair with a not-long-enough tee shirt for a less prominent red carpet event and paparazzi. 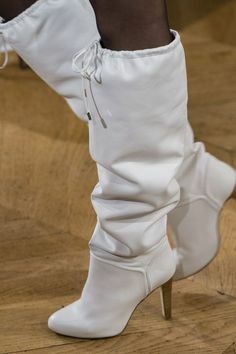 These have been named “knife boots,” and are featured in the Balenciaga fall advertising campaigns. To the extent they are bought, it is fair to guess that women mostly will want them in basic black. Still, as footwear goes, they’re pretty far out there. 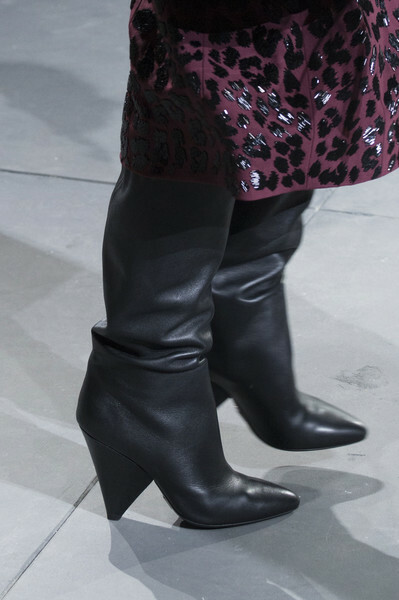 The knife boots’ antecedents over the last 10 years are over-the-knee boots. 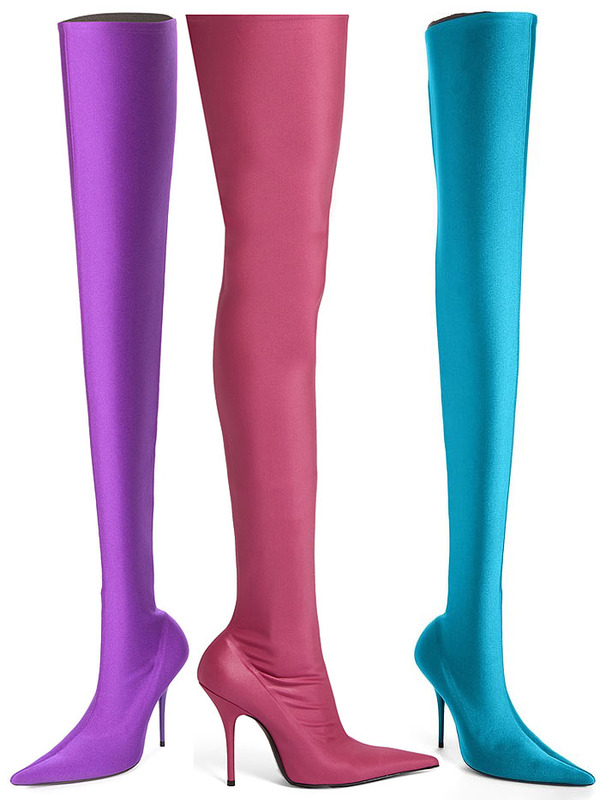 A early-adopter friend of wore a leather pair of these to a holiday event some years back; they looked rather stiff and seemed to bother the hem of her skirt. This may be why new versions are coming out in more pliant suedes and as “sock boots,” the latter of which used to be short, sturdy numbers appropriate for tramping through the frozen north. 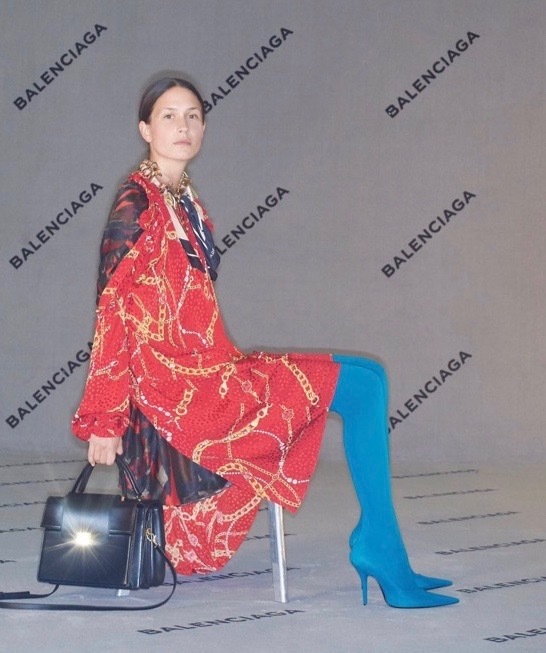 Here is a Balenciaga advertisement, including the knife boot in blue, that ran in the all-important September fashion magazines. Naturally other designers are offering their own versions. Here’s a photo from a Salvatore Ferragamo ad. And one from Ralph Lauren. These boots have wrinkled leather shafts. This is a trend that comes and goes and then comes back again. This year it’s back. Saint Laurent. This tall boot is being marketed in various leather colors, but the shiny silver version has drawn the most attention. If you want a pair, you will need to put your name on a wait list, and then save your money to pay for them. The price is $10,000. The Idiosyncratist already has purchased a pair of winter boots, block-heeled black ankle boots that will be good with pants or skirts. These replace a previous pair of black ankle boots that died of overwear. Regular readers know that the Id is something of a minimalist, constrained by limited closet space and a frugal nature.